Immediately there was confusion. A range of different people at airports around the world were unsure about what they were meant to be doing. Were airlines allowed to let people from certain countries onto planes? Were immigration officials meant to hold people who had arrived from these seven countries or were they meant to send them back? Were Australians, Canadians and Brits who held dual citizenship with these countries banned? We are seeing how the Judicial branch of Government provides checks and balances on the Executive to ensure that this Executive Power stays within the limits of the law and the Constitution. An Executive Order is issued by the President to direct Federal Government departments to do certain actions. We all know that the President wrote his signature on a piece of paper in a leather folder, held it up to the camera and that was the signing of an Executive Order. Then all of sudden there was chaos at the airports. But what does that really mean? It might be best for us to first examine the Executive. Our system of Government and the American system is split into three separate powers. Each of these powers provides checks and balances on the other two. First we have the Legislature, in Australia that’s the Parliament and in the US they call it the Congress. This arm or branch of Government in both countries is made up of two Houses who make the laws. The next arm of Government is the Executive. They run the country and administer all the Government departments, but they must stay within the bounds of laws made by the Legislature. The party that has the majority of MPs in the House of Representatives in Australia is effectively the Executive (we’ll explain in more detail a bit further down). We have a Prime Minister and all the other Ministers and we call them ‘the Government’. In the US the President is the Executive, along with his Vice President and all the appointed Secretaries of State. Then we have the third branch of Government which is the Judicial Power. This is the system of courts, with the High Court in Australia and the Supreme Court in the US sitting at the top. There are a series of lower courts in both our countries that lead up to the High and Supreme Courts who are the final arbiters. 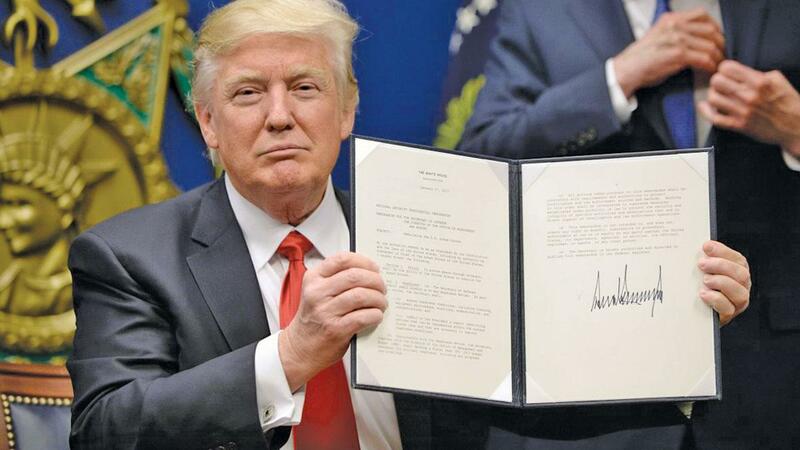 If someone believes that an Executive Order in the US or an Executive action in Australia is outside the bounds of law the Judicial branch of Government is the adjudicator in the disputes. So the Judicial branch of Government provides checks and balances on the Executive and Legislative branch to ensure that these other two powers stay within the limits of the law and the Constitution. There are many who believe that the US system has too many checks and balances between the different branches of Government, rending them almost ungovernable (click here to watch the former Finance Minister of Greece, Yanis Varoufakis mention this at the Sydney Opera House). But we must remember, many Constitutions around the world, including the US Constitution, were written after years of conflict, when trust in people with power and institutions was low. They built their system with so many checks and balances for that reason. In Australia, we wrote our Constitution so that the six British colonies could join together to create a country. We weren’t fearful of Government institutions. So while we also have a strong separation of powers, our system was designed not to be held up too much by disagreements between the three arms of Government. Officially the Executive power in the US is vested in the President who then appoints the State Secretaries to run the departments of Government. The appointments need to be approved via a vote in the Senate. This is one of the Legislative Power’s check on the Executive Power. For example Jeff Sessions was nominated to the position of Attorney-General by the President in November 2016 and then earlier this week his position was confirmed by the Senate. He will now run the United States Department of Justice. It will be up to this department to defend the Executive Order in the legal action occurring in the courts. Officially, in Australia the Executive Power is vested in the Queen and exercisable by the Governor-General who is advised by his or her Ministers. The Governor-General must act on the advice of the Ministers in all but a few circumstances, and is there as an additional and final check that all processes of Government are being followed. In Australia the Ministers of each department and the Prime Minister must sit in Parliament (Section 64). So there is a bit of a crossover here between the Legislative and Executive Powers. The State Secretaries in the US do not sit in their Congress, meaning these powers are more separate than here in Australia. So the equivalent to the United States Department of Justice is our Attorney-General's Department and the Responsible Minister is Senator George Brandis. In recent cases where the High Court has been sitting as the Court of Disputed Returns, it was the Attorney-General’s department who made submission on behalf of the Government. When the Government needs to be represented in Court, this is arranged by the Attorney-General’s Department. The Judicial Power of the United States is vested in the Supreme Court and in Australia it’s the High Court. The word vested is a word that you probably don’t hear much in the normal world. But it means that the Court has absolute power. And so if the Court finds that an Executive Order in the US (or an Executive action in Australia) is unlawful it will be overturned. If the President is attempting to do something that is unconstitutional or outside the bounds of what the legislation or what regulations will allow, then the Courts can strike it down. This ensures that the Executive follows the rules that have been set out. The Courts are the adjudicators. No Person except a natural born Citizen….shall be eligible to the Office of President; neither shall any Person be eligible to that Office who shall not have attained to the Age of thirty five Years, and been fourteen Years a Resident within the United States. So you have to have been born a US citizen and at least 35 years of age to be eligible to become the President in America. Our Constitution also goes into minute details about who is eligible to sit in Parliament and about how business is conducted by the Legislature, the Executive and the Judiciary. The rules in our Constitution and the US Constitution are being followed and adhered to every day. If someone believes these rules are not followed there is an opportunity to ask the Supreme Court in the US and the High Court in Australia to decide whether this is the case. The Constitutional rules we have recently seen come into action in Australia include the automatic removal of Rod Culleton from the Senate due to bankruptcy (section 44iii), then the High Court found him to have been ineligible of being chosen as a Senator (section 44ii). After the election last year the Senate split themselves up into two groups, one that will sit for six years, the other for three. This process is written in section 13 of the Constitution. The last election was called using the rules outlined in section 57 of the Constitution, which occurred to break a deadlock between the two Houses of Parliament. After the election the Government continued to follow those rules and passed the legislation. The other rules are found in legislation, which is better known as the law. Kids in Australia grow up knowing they can’t break the law. The law applies to everyone, including the US President as the Executive. So if the Executive asks a Government Department to do a certain action, those actions must be lawful. Legislation that has already been enacted must allow for that action. If this is not the case then legislation can be created before a Government Department can do a certain action. At other times a regulation can be changed to allow that action. By spreading the Power of Government across the three branches of Government both the US and Australia are able to prevent dictatorial leaders. The Executive in both our Countries is bound by the law and the Constitution like every other single person in our respective countries. Of course people are worried and unsure about what’s going on, but we are seeing the processes of the checks and balances occurring as it should in both our countries. We are also witnessing a bit of argy-bargy between the President and the Judiciary. Is it okay for the Executive to criticise the Judicial branch of Government? Should there be tensions between the Court and the Government? Or are people better served if these two branches work together collegially? Traditionally it’s frowned upon for the President to attack the integrity of the Judiciary and its officers. Donald Trump’s Supreme Court nominee, Neil Gorsuch, has just this week stated that the Presidents tweets attacking a Federal District Court judge were disheartening and demoralising. It’s likely that the several cases that have begun will make their way up to the Supreme Court. We’ll have to wait and see what is decided.